Chilling Adventures of Sabrina is back on Netflix with season 2. It begins right where season 1 and the Christmas episode left off. This time around it’s much darker and more sinister. Read more in our season 2 review! 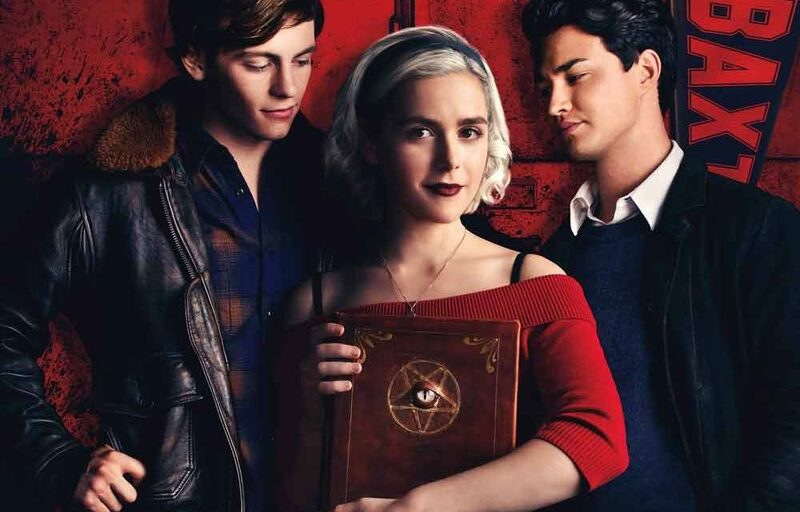 Season 2 of Chilling Adventures of Sabrina is on Netflix from April 5 and this time everything is much darker. After all, Sabrina did end season 1 by signing the “book of the Beast” and now her soul belongs to the Dark Lord. Obviously, Sabrina isn’t completely on board with all that this entails. But she’s getting there. Also, she’s enjoying the power she continues to discover she posseses. Chilling Adventures of Sabrina is a show targeted at the late teen and young adult demographic. This also means it deals with a lot of current issues. It did in season 1 and continues to do so – in an even bolder way – with season 2. I, for one, love it! Yes, it’s about a girl – and she’s the best! Episode 1 of Chilling Adventures of Sabrina season 2 features a lot of current issues around gender (both in regards to misogyny and transitioning). I’m sure many will find this annoying, but I have no doubt this will be exactly the people who need to listen to the message. Unfortunately, most of them will also be the people who absolutely will not be listening. Instead, we’ll hear #MeToo jokes and “Social Justice Warrior” proclamations. As if this is an insult. Every other time Miranda Otto appears on screen with her awesome can-do attitude, I find myself straightening my back saying “I am no man!” This is one of the women playing Sabrina’s aunt and the other was the brilliant supporting sidekick to Wonder Woman. I mean, hello, you cannot be surprised that this show is pushing girl power! Also, yes, there is a trans storyline, but if you paid attention during season 1 of Chilling Adventures of Sabrina then this will come as no surprise. And the same goes for the Christmas special… it’s been a story in the making all along. Anyway, if you can’t handle being confronted with issues that women (of any age and race) are faced with, then prepare yourself. Mary Wardwell is the new High School principal when season 2 begins. But that’s not all she is. We get a lot more insight into the origin of her character who also goes by the names “Madam Satan” and “Lilith”. To horror fans, the name Lilith should evoke all kinds of awesome expectations and Michelle Gomez is the perfect actor to live up to those. She continues to make Mary Wardwell a fascinating character that I, for one, cannot get enough of. Sure, she has her own agenda, but she also has a strong desire for fairness. She’s a wonderfully complex character and the ultimate badass of Chilling Adventures of Sabrina. Well, along with Aunt Zelda (Miranda Otto) who also tends to surprise again and again. Aunt Hilda (Lucy Davis) continues to be a total sweetheart, but she is still a disciple of the Dark Lord. In other words, she’s capable of much more than her demure appearance might lead you to believe. Watch Season 2 of Chilling Adventures of Sabrina on Netflix! 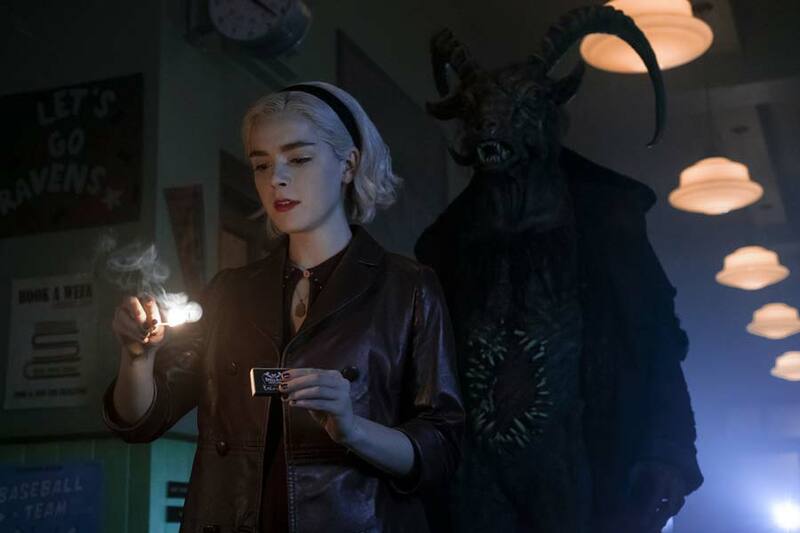 If you felt season 1 of Chilling Adventures of Sabrina was a bit too bright and funny, then season 2 should be more your style. The evolution of Sabrina’s life alone is enough to bring a whole lot of darkness into the Netflix series. Also, the other characters get more room to explore their deepest wishes and desires. Some are good and sweet enough, but the story tends to focus on what people will do to get what they want. And their actions are often more calculated and sinister than good and sweet. Of course, if you did already enjoy season 1, then you should be more than happy to get into this second season. And yes, more seasons have already been greenlit by Netflix, so we have season 3 and season 4 to look forward to as well. Chilling Adventures of Sabrina season 2 is out on Netflix worldwide from April 5, 2019.